Karl Blossfeldt (1865-1932) was a German instructor of sculpture who used his remarkable photographs of plant studies to educate his students about design in nature. Self-taught in photography, his hobby soon grew into a life-encompassing passion. He devoted himself to the study of nature, photographing nothing but plants for thirty-five years. Blossfeldt was a student in Berlin at a time when the judgenstil movement was at its peak. This ‘Young Style’ was the German equivalent of Art Nouveau, and used organic designs often found in nature as its inspiration. In 1891 he received a scholarship which allowed him to travel to Italy, Greece, Egypt and North Africa. During this experience abroad he had an extraordinary opportunity to collect many rare and beautiful plant specimens. After five years he returned to Berlin, where he constructed his own large-format camera and began making images of a wide variety of plants. 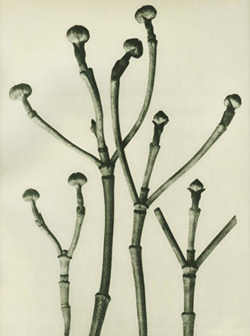 Blossfeldt focused on flowers, stems, leaves, buds, tendrils, seeds and seed pods, meticulously arranging them to show the intricate, elegant architectural structure of their natural formations. His photographs were taken using either a vertical or horizontal perspective and could be magnified up to twenty-seven times their actual size, revealing extraordinary details within the natural structure of the plants. In the process he created some of the most innovative photographic work of his time, the simple yet expressive forms captured on film affirmed his boundless artistic and intellectual ability. 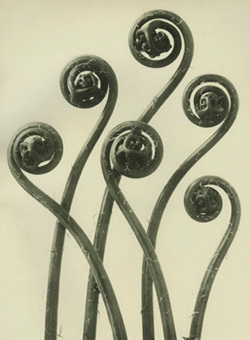 In 1928 Blossfeldt published his masterwork, Urformen der Kunst (Art Forms in Nature). This was followed up with Wundergarten Der Natur (Magic Garden of Nature), published the year he died, 1932. These rarely seen subtly toned black and white photogravure images are now recognized as vital contributions to the history of photography and they remain as intriguing today as they are beautiful. Their affordability also makes them a wonderful item with which to begin a collection. 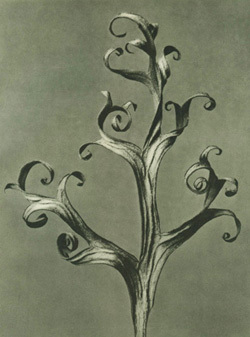 Soulcatcher Studio offers a large selection of first edition photogravures by Karl Blossfeldt, all of which can be viewed here. Soulcatcher Studio is proud to present the complete 1928 first edition portfolio of Karl Blossfeldt’s masterwork, Urformen der Kunst (Art Forms in Nature), exhibited for the first time ever in its entirety on the World Wide Web. Click here to view this exhibition of exquisite fine art photographs. Karl Blossfeldt : 1865-1932, by Hans Christian Adam, TASCHEN, hardcover published April 1999. Art Forms in the Plant World : 120 Full-Page Photographs, by Karl Blossfeldt, Dover Publications, softcover published February 1986. Karl Blossfeldt, by Rolf Sachse, TASCHEN, softcover published April 1997. 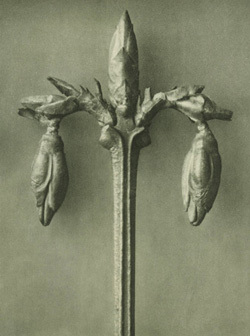 Karl Blossfeldt : The Alphabet of Plants, te Neues Publishing Company, hardcover published December 1998.